The London GD Handball Club has come a long way since its inception to its present perch at the pinnacle of the sport in the UK. Founded as a Danish women only team in 1976, with only 2 training sessions per week, this club has truly achieved enviable milestones over the years. Originally known as the Great Dane Handball Club, it had to undergo a name change in 2010 to firmly reflect its solid establishment in East London. It also became incorporated into a limited company at just about the same time and has been operating as such to date. Anne-Marie Thrysoe and Andrew Ferguson must be walking with a chip on their shoulders, given the host of league and championship cups this club has accumulated. This impressive feat has been replicated by both the men’s and women’s teams’. Since winning the 3rd double (League and Cup Champions) in 2010, and making a historic maiden entry into the 3rd round in Greece in the same year, the great Dane Handball club has become a towering European force to reckon with. Subsequent defining victories were also registered in the 2010/11 and 2011/12 seasons by the men’s team. The clinching of the South Regional Championship, plus winning the Super 8 English National League being the most notable. The London GD ladies also ended the 2012/13 season in style by winning the EHA Cup against Thames Handball Club. 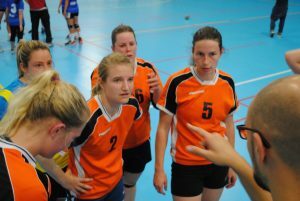 Over the years, this great Dane Handball Club has transformed from having purely Danish players in its ranks to incorporating other players from different nationalities. Most players are registered with the club, whilst others are just training partners. The same growth has also been mirrored in the clubs shifting of their physical facilities. Having started out at Ruislip Eagles Sports Centre, the club has moved twice to larger grounds. The first was the move to Wapping Sports Centre in East London and the Olympic Handball Arena where they are presently situated. Take your handball talent to the next level, by signing up today!